Sudoku is a mathematical puzzle based on a 9 x 9 matrix. This matrix is subdivided into 3 x 3 submatrices. The aim of the game is to complete a partial filled matrix with numbers from 1 to 9 such that every number occurs exactly once in every row, column und 3 x 3 submatrix. With backtracking all combinations can be systematically found. To decide efficiently whether a new number is allowed to place in a field, you should think of an data structure with which for a given row r and column c the nubmer z can be placed into the field or not. This data structure is similiar to the one used for the eight queens problem. Before solving this Java programming exercises you should have finished the Java backtracking algorithm to solve Sudokus. You can create new Sudoku puzzles by inserting n random numbers in the range from 1 - 9 and checking for each new number, whether the rules of the game still apply or not. After that, you can call the backtracking algorithm to solve the new Sudoku: if a solution have been found, your Java programm has created a new Sudoku puzzle; if not, you start the whole process again. This method is able to create new Sudoku puzzles with a certain probability 0 < p < 1. It is unlikly, but possible, that your algorithm never terminates. But when it terminates, the result is always correct. Such algorithms based on randomize creation of problem solutions are called . Add a Java method that creates new Sudoku puzzles with n numbers to the existing backtracking algorithm. At the start there are only a few possible moves, but the choices are increasing during the game. The following tables give the initial position of the pegs and subsequent moves. Implement a recusive backtracking algorithm in Java, that finds a solution to this puzzle. 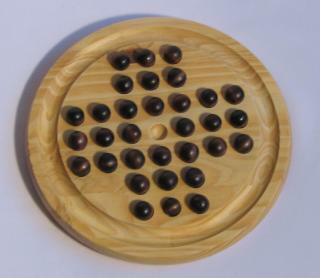 The solution can be stored as a sequence of boards: one for each move. The board should be implemented as a Java class with an internal 7x7 matrix. In the backtracking algorithm you must compute all possible jumps for a given situation. With a 2.2 Ghz Athlon 64 I found a solution within 200 ms. Without heuristics or optimizations to the code. A solution can be found with brute-force.